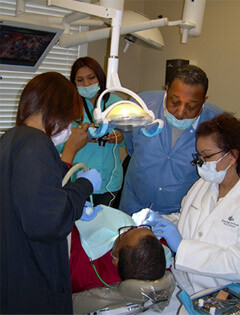 Our Mentored Placement Program was developed for the dentist who wants to custom design their learning experience. Whether you are looking for assistance with your first implant case or progressing to more complex cases, our staff is here to guide you. This program is designed for you to work with your patient from start to finish, ensuring the highest quality learning experience. Dr. Kelly will be at your side every step of the way to provide immediate and detailed assistance. We recommend the selection of a case that is ideal for your experience level and will maximize your mentorship. This will improve the probability of a successful case, patient satisfaction, and the ability to market your implant practice. Our Mentored Placement is designed to expand your skills and build the confidence you need to move forward. The cost of the Mentored Placement is dependent on the complexity of the procedure. We encourage you to confer with your patient and divide the cost of the procedure as necessary. Remember, you and your patient will benefit from the opportunity to work with our knowledgeable implant staff and our state of the art technology. Part 1: Simple Implant Placement: This experience is designed for dentist who wants to or is already accepting simple implant cases and desires the direct supervision and support from Dr. Andrew Kelly. This mentorship is great if you are in the early to intermediate stages of building your implant practice. The ability to customize your Mentored Placement will ensure you acquire the knowledge and skills you need to build your implant practice. Part 2: Hard and Soft Tissue Development: This will provide the hands-on experience and knowledge base so you are confident while maneuvering through more complex implant treatment plans. Most dentists find it easier to make dental implants a permanent part of their practice once they understand how to create a well prepared implant site. Customize your learning experience to include the surgical techniques you need to create a diverse and profitable implant practice. *Continuing educational credits will be awarded to each participant based on the amount of hours of their Mentored Placement. To apply online, fill out the information below and then submit your payment via PayPal. To apply offline, simply download and fill out the faxable mentee application as well as the faxable registration form in PDF format. You are NOT registered for this course until payment is received. Payment options will be provided to you on the page following this form. When are you available to take part in mentoring activities? What do you hope to learn, understand, or be able to do better as a result of your experience as a mentee? Have you served as a mentor or mentee in the past? If so when? Please describe your experience. What are your expectations of the DOS Mentoring Program? Why do you want to participate in the program as a mentee?